Today has been a cool grey day but after a long week in the office it was good to get outdoors for a while. 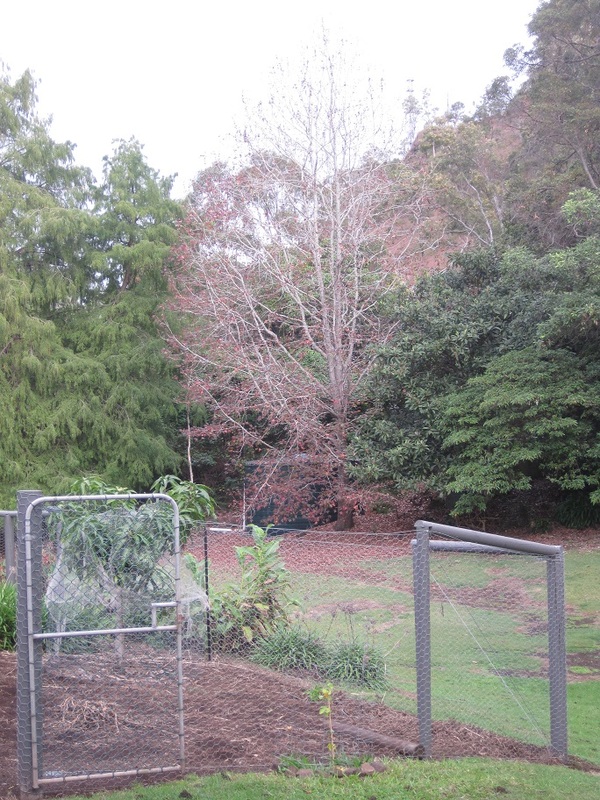 The liquidamber tree was looking stunning in red a couple of weeks ago but now there is not much foliage left. The Duke was mowing the lawn so I decided to spend some time in the vegie garden area. Much of the area has been covered with several pumpkin vines but they are gradually dying off. The have had the added benefit of killing off some of the weeds and grass that was growing in the area before we finished the fencing. It is my goal not to have any lawn within the fenced area. There will eventually be 9 raised garden beds as well as the blueberry patch which will be all mulced and other beds around the perimeter. I am not sure how to keep the grass from growing on the paths between the beds but I started today by covering a small area between the ends of 2 of the beds. I used several layers of newspaper and then some mulch that The Duke had created some weeks ago when he muched a pile of prunings. I bordered the sides with some rocks, a commodity of which we have an abundance. This is a bit of a test case as I am thinking of using this method to cover all of the paths/walking areas once the garden beds are finished. I moved the concrete besser blocks that were bordering this small area. It was one of the early garden beds we created when we moved here but it is now in the orchard area. I did not take a ‘before’ photo but this is all that is left after the blocks were removed. There was a cherry tomato growing wild and spreading on the ground so I found a star picket and created a stake for the tomato. You can so it to the right of the photo. The plant looks pretty straggly but it still has flowers on it. Here are the concrete blocks in their new location just inside the fence. This is the area where I am plaaning to plant asparagus. I am not sure whether it will be a temporary or permanent home for the blocks. 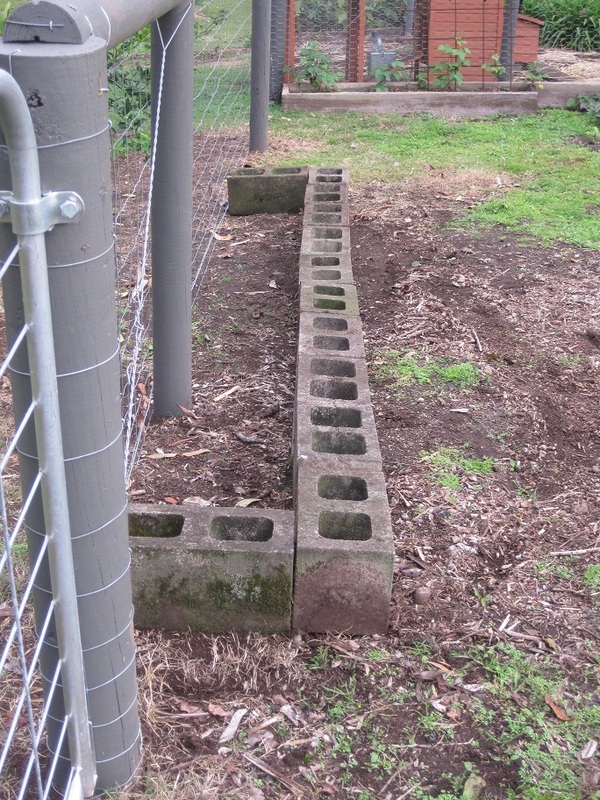 Wherever I end up using them, I will also fill the blocks with soil and plant in them as well. 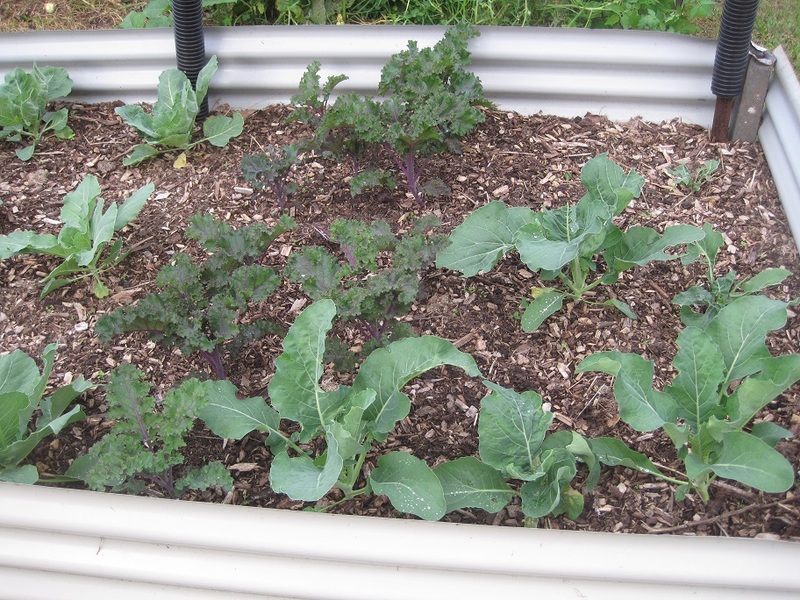 The cabbages and kale are growing. 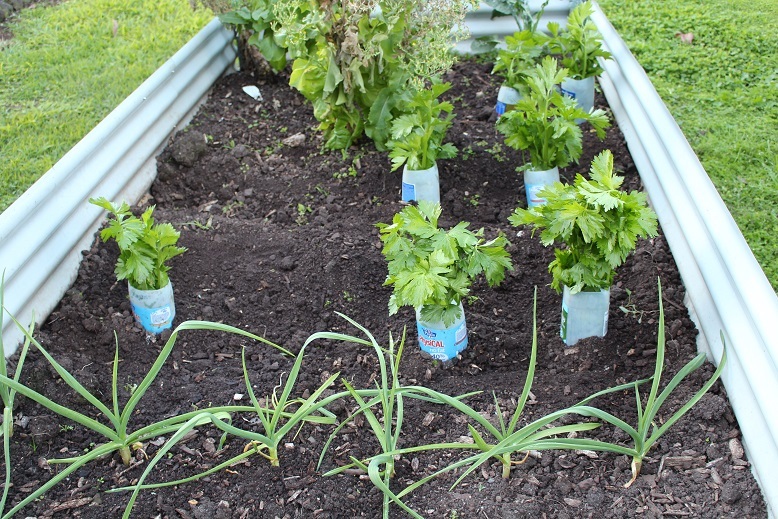 I also planted some beetroot, rocket, radish and parsley seeds so I will see what success I have from those. I hope you have enjoyed seeing my garden as much as I enjoyed the time spent working in it this afternoon. 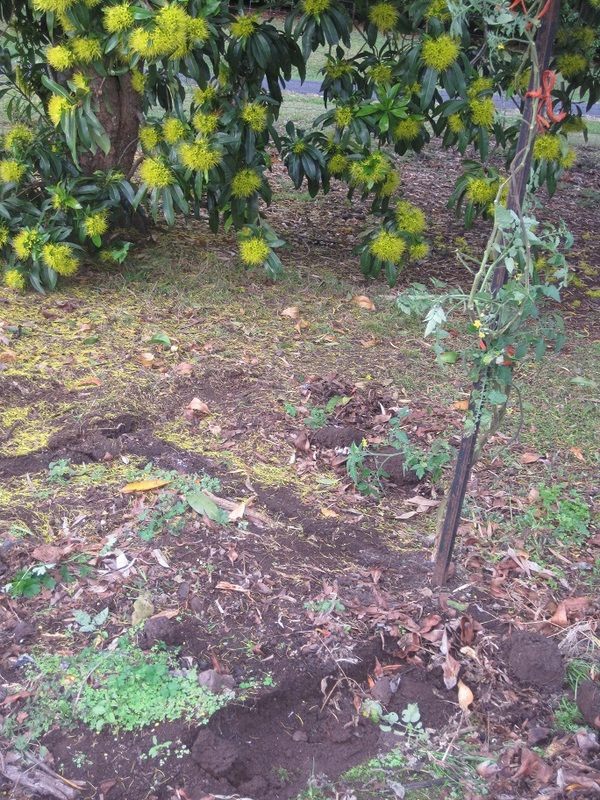 We have been living here for over 8 years now and when we moved in there were no vegetable gardens and only 3 fruit trees – avocado, orange and lemon in rather odd spots in the yard. We built some vegetable gardens which have evolved over time and the chicken run has been moved and is now next to the vegetable gardens. 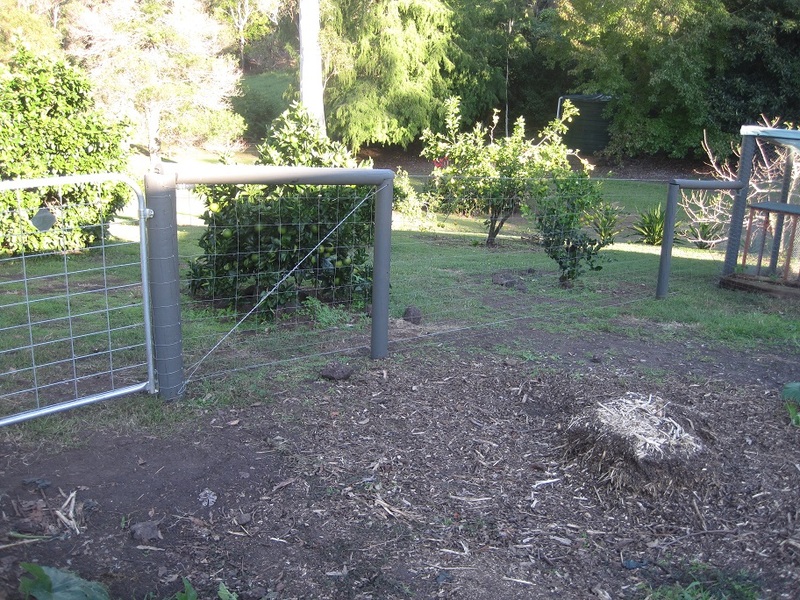 Since free-ranging chickens and vegetable gardens do not go terribly well together we decided to fence the entire area containing the garden beds. This has been a very long-winded process but we can finally see the end in sight. Today we actually did one run on fencing and here is the result. We hope to finish the fencing which will enclose the vegetable garden area next weekend. 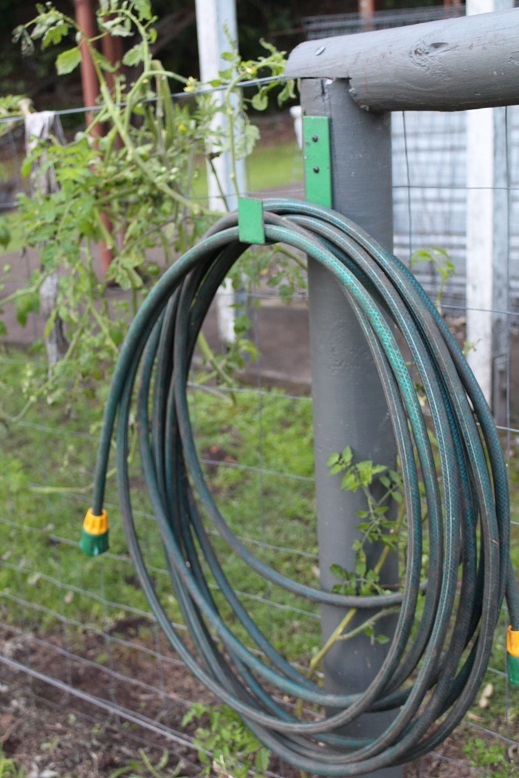 It should mean an end to the various bits of wire contraptions that I create to keep the chickens away from the seedlings. 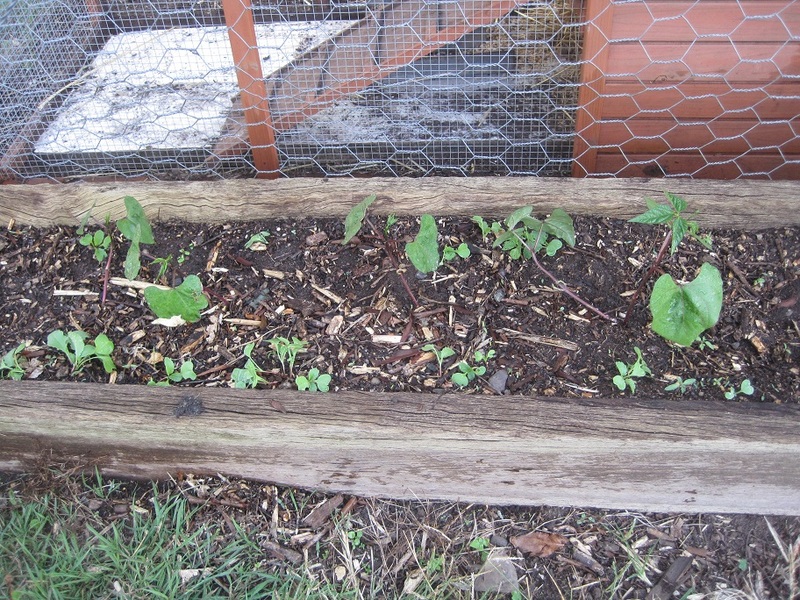 These are peas and pak choy seedlings that we bought at the Yandina markets on Saturday. We also bought lettuce, broccoli, cabbage, kale and cauliflower which are in the other beds. 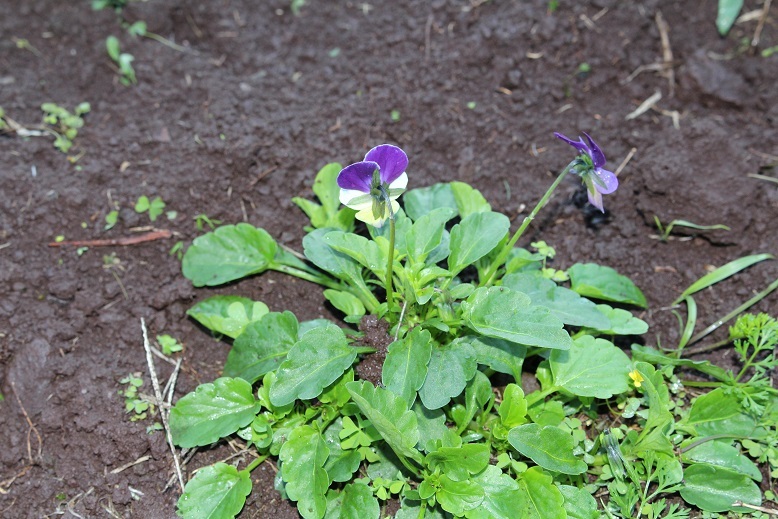 Here are the purple beans and radishes which have come up from seed I planted a couple of weeks ago. What are you growing in your garden at the moment? We collect all of the fallen branches on our land for firewood, so today The Duke spent some time cutting up some more logs that were stacked and waiting to be cut. 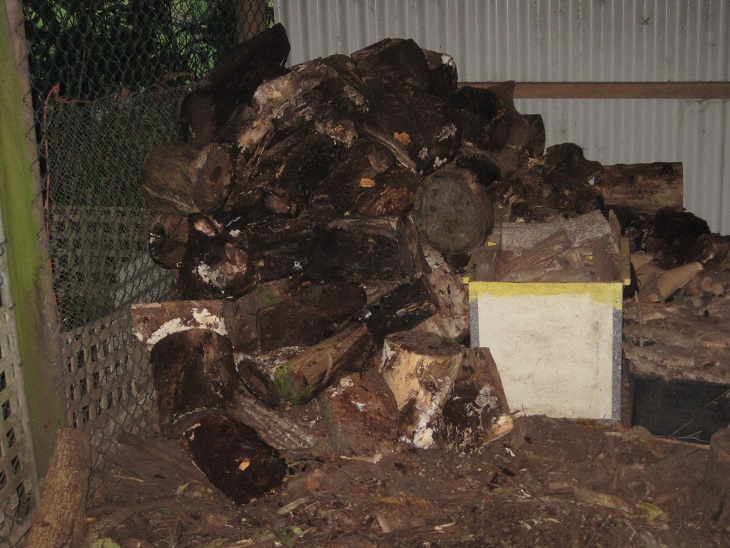 Here are some of them cut and waiting to be stacked in the woodshed. The mulcher which you can also see in the photograph also got a workout as we mulched several piles of smaller branches as well as some palm fronds and rotting branches. As always, nothing is wasted so some of the mulch was added to one of the raised garden beds that we are filling and the rest will be spread under the native shrubs which are planted along part of the front boundary. The mulch keeps the weeds mostly under control. Next, we headed over to the area near the vegetable gardens. There was more debris to mulch, including the remnants of the corn stalks. While the Duke and Psycho Dog were hard at work, I turned my attention to the new garden bed I built yesterday. 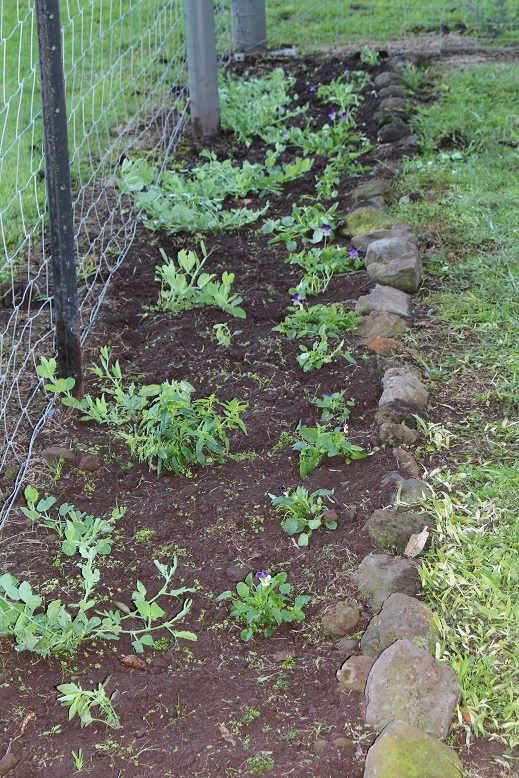 I needed a bit more mulch and soil to fill it up and then I planted some Purple King climbing beans and radishes. 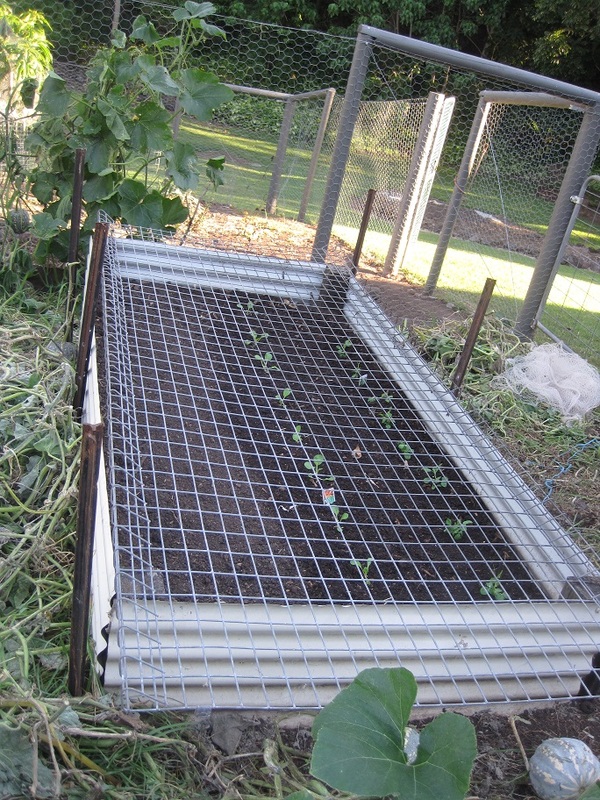 It is along the outside of the chicken run so the fence will provide an excellent trellis for the beans. I grew these beans a few months ago and had an absolutely fantastic crop so decided to grow them again. 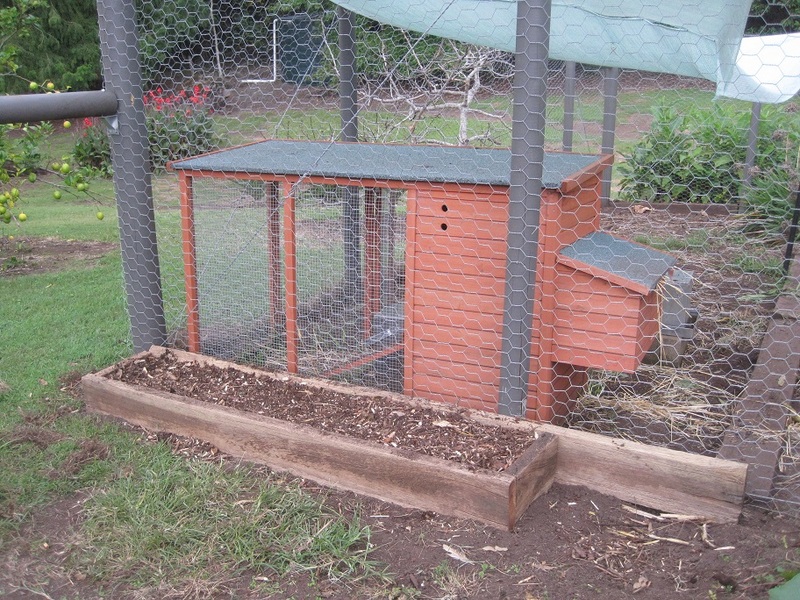 I added a couple of star pickets and some wire to enclose the bed so that the chickens cannot dig it up when they are free-ranging. 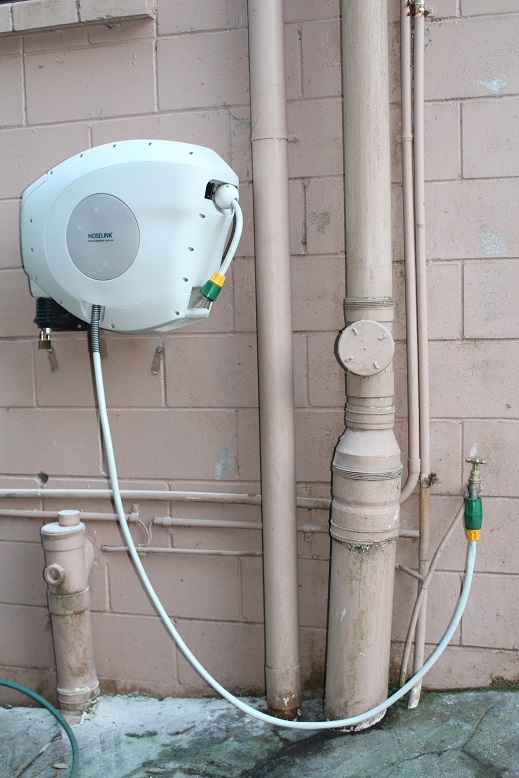 I was just putting the finishing touches to the wire surround as the first drops of rain fell late this afternoon. We had a tremendous thunderstorm with some huge bolts of lightening very close by but were lucky not to lose power. 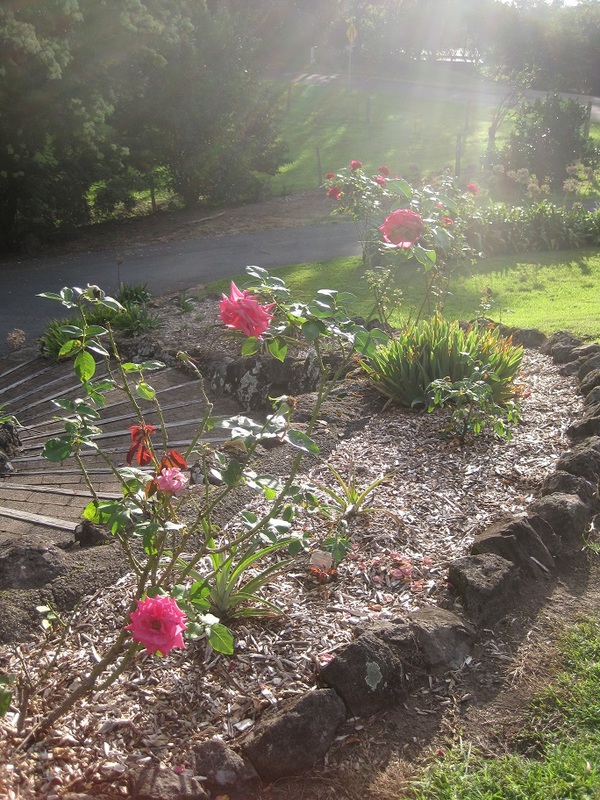 Finally, just to prove that our garden is decorative as well as functional, here is a photo of the roses flowering in the front garden. Tonight I am going to make some decisions about my 33 items for the round of Project 333 which began on April 1st. I have kept track of what I have worn so far this month and will include them in the tally. I hope to share the details of my choices with you tomorrow. On Friday afternoon I moved some of the wood that had been left to season. 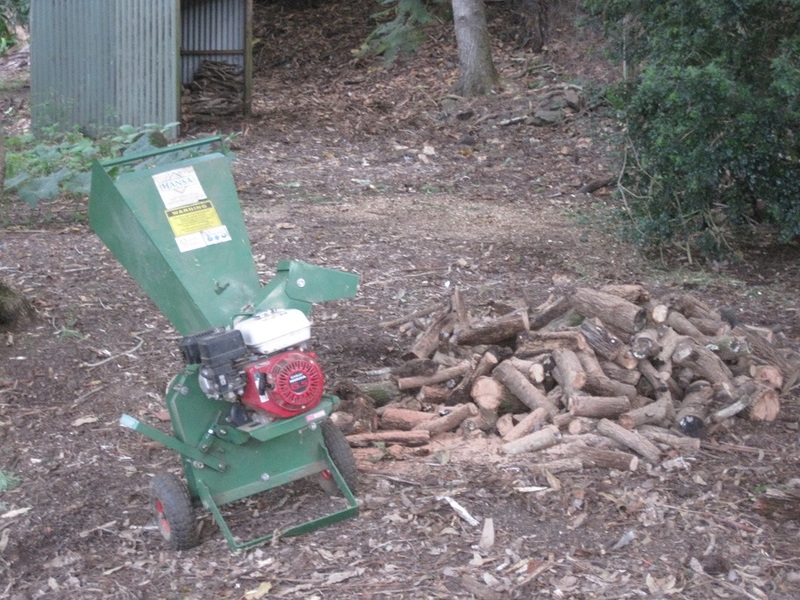 It is now in the woodshed and will be split and added to the the stash of firewood which we keep for the wood heater. 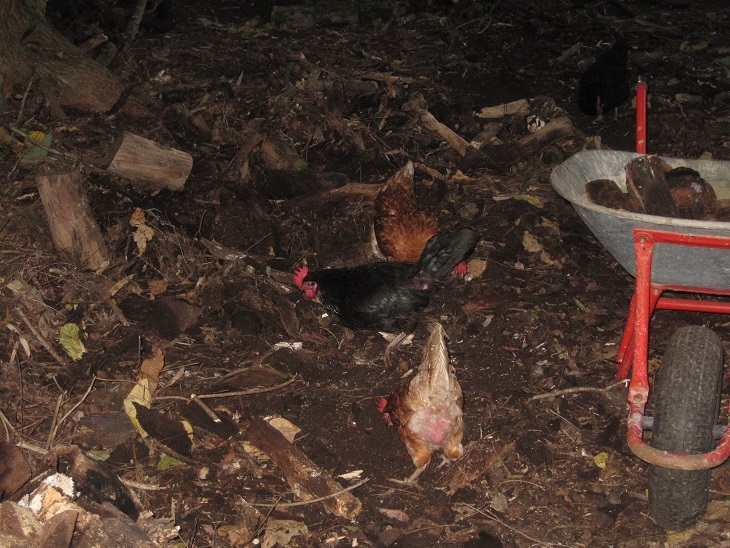 Once I disturbed the ground, I was surrounded by the chickens who were eager to feast on the grubs and other insects which were lurking under the wood. They had a wonderful time turning over the soil and looking for tasty morsels. This weekend we have built 2 more raised garden beds. One of them is lined with heavy cardboard that I had been saving. Then we piled in a thick layer of dry leaf litter followed by some lawn clippings. 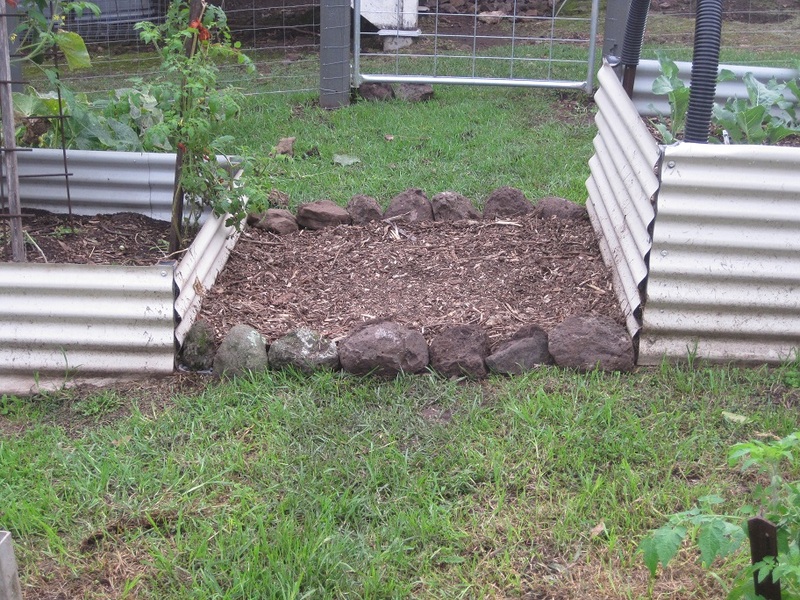 We will add more soil, compost and probably some mushroom compost which we will buy locally. 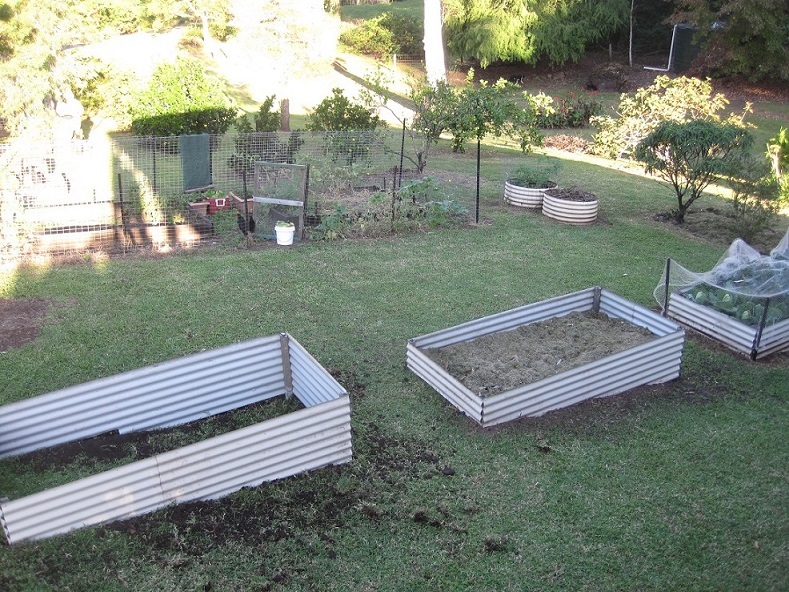 These 3 garden beds have been constructed entirely from leftover and salvaged materials. 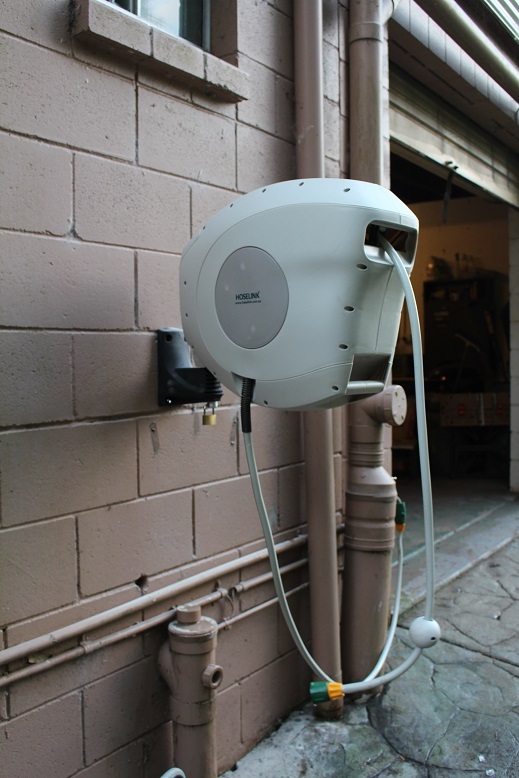 I started to think about how we manage to use and recycle much of what is generated on our property. The wood is from tree limbs that have fallen or been lopped on our block. These will be used to heat our home. 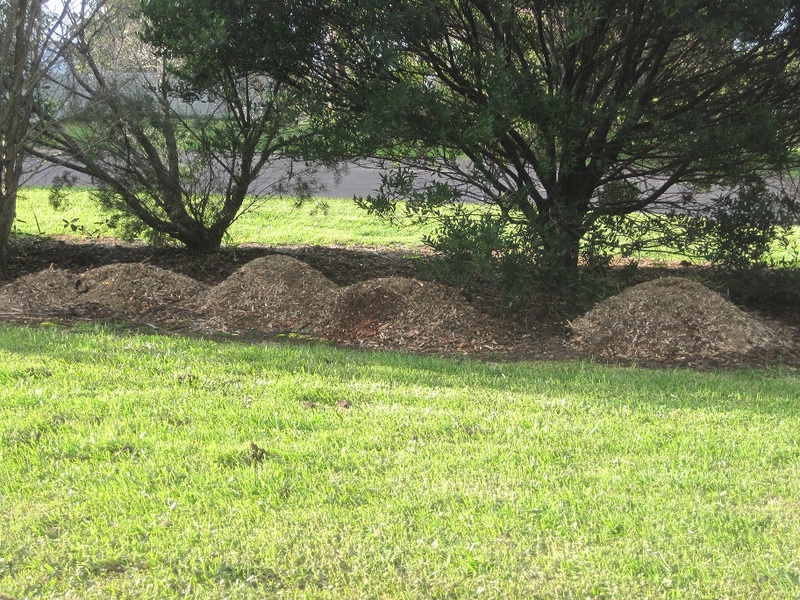 The resulting ash is added to the garden beds, either directly or via the compost. Any charcoal is saved in a jar of kerosene to use as firelighters. We grow fruit and vegetables. The chickens provide us with eggs. The scraps and peels are fed to the chickens. The chicken manure is added to the garden beds. 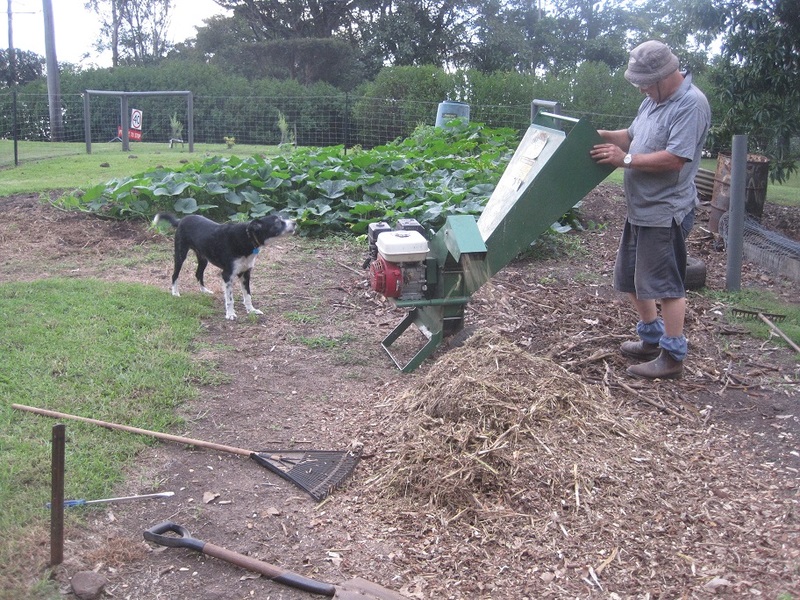 Leaf litter and lawn clippings are added to the compost. It is all part of a never-ending cycle.